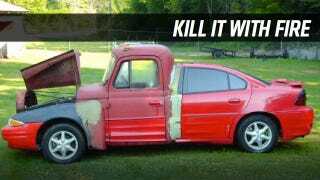 Someone in East Kentucky has grafted the cab and hood of a 1962 truck onto a 1990s Pontiac Grand Am and has put it up for sale online. Jesus, Craigslist, this is more disturbing than your missed connections listings. Our friends at Hooniverse found this thing, and it will be haunting our dreams for some time. The vehicle is advertised as having "every option that a car could have," mostly because this is a car, only with the cancerous growth of a '62 International truck sprouting out of the front seats. The base Pontiac's front clip has been swapped for one off an Oldsmobile, just to classy things up a bit. I can hear the truckcar screaming from here, begging to be put out of its misery. Won't anyone buy this poor wretch and destroy it? Or are you so cruel that you would see it drive on the roads or rot away in shame in some Kentucky backyard? See the listing here, or here if it goes down.